I was reading the FPI blog piece about The British Comic Awards first ever shortlist (because I'm on the list and I wanted to see if anyone had anything nice or horrible to say about me, it's what we do) and I came across a mini-tirade from an ardent 2000ad blogger about the absence of 2000ad from the shortlist. There followed a long and impassioned description of the many talents and wonderful stories that have appeared in that comic. The chap was clearly very angry about this because he is a 2000ad fan. And then it struck me that there was something about the list and the omission of 2000ad that was quite positive. There's a connection between the five books nominated, something they share that 2000ad doesn't. And something born out by the fact that it was a '2000ad fan' who leapt forward. When I started Don Quixote I wanted to make a book that might be read by people outside the comics' world, and it was around this time my then wife pointed out that she had no idea who was speaking in these caption things in a comic I handed her. "Well, it's either the thoughts of a character, a first person author or a third person author or..." Why should she know? She doesn't read many, if any, comics. So I put in that bit where the voice from the cell, the author's voice, pops up in a caption and tells you that's what he's doing. I could do this in Quixote because the whole book is full of these kind of metafictions anyway. There's nothing wrong with a book being difficult to read, often the most rewarding books are, but I didn't want mine to be off-putting purely because of modern conventions in the medium. This idea was very important to Woodrow and I when we were editing Nelson, we wanted a book that could walk and talk on its own in any company, not something that was a foreigner the moment it stepped outside of a comic shop. This has been born out by the reaction we've had from people who haven't read a comic since they were a child in the 80s/70s/60s etc. I don't have a copy of Goliath or Science Tales yet, but I'm very familiar with the work of these two authors and admire both. What they share is clarity. Darryl's Psychiatric tales is a book I gave to people not because they liked comics, but because I knew it would touch them deeply and inform them. It didn't matter whether they read comics. 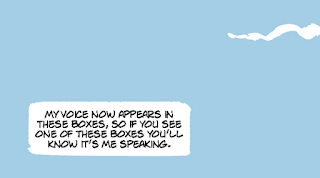 Equally Tom's work is all about instantaneous reading, his strips are fast to read than words. Anyone who encounters them receives the messages sent. Then there's Luke, whose Hilda book has been read and loved by me and my daughter. It's a kids book. 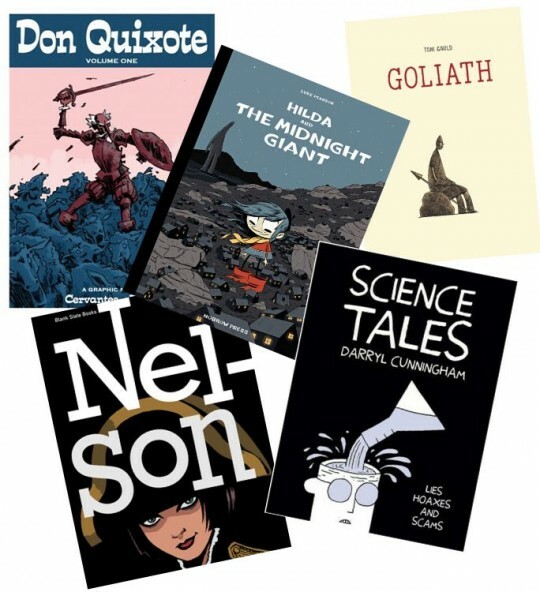 This doesn't mean it doesn't warrant the same accolades as an adult comic (actually I'm not sure whether Quixote also counts as all ages given that many kids have read it). My daughter knows that comics can offer more than three pages of filler in a merchandise tie-in, she has read Hilda and has high expectations of comics. Good. Well, there's the connection between the five nominees. So where does 2000ad fit in, you ask. 2000ad, for the purposes of this blog post, represents a different relationship between comic and reader, the traditional relationship - comic and fan. Comics are a nerdy fan world, and that's fine. 2000ad has given me some of my best experiences reading comics. 2000ad has been THE comics industry in the UK for many years, but it is almost totally 2000ad fans making comics for 2000ad fans and it is in a sense a celebration of itself. 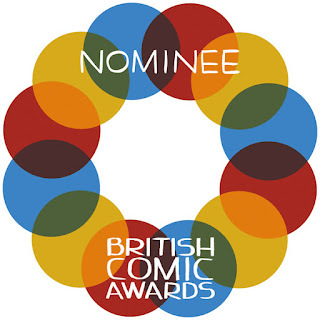 What these awards highlight is not, as our afore mentioned 2000ad blogger claimed, a leaning towards 'indie' it's a leaning towards new readers. Without them we're dead. A friend of mine involved in the arts but not specifically comics looked at a copy of 2000AD or something of that ilk and just said "it's alienating". I never really needed to give the issue any more thought. The BCAs really do embrace something different from that alienating, closed comics culture and for that reason they should be celebrated. I do agree that some 2000ad content can be pretty much unreadable to the uninitiated . Some of us do make great efforts to be legible however. I designed Dante so my Mum could read it. Though years of continuity mean that 'waiting for the trade" is really the only way in. Such is the peril of serialized fiction. Well, as I say, I'm clearly writing this as a 2000ad fan of old. Anecdotally, I tried to get my eldest (now 15) into 2k a little while ago and he felt like it was a foreign language. Dante is more traditional for sure and the tpb is a different entry point. It's not just 'easy to read' that's the issue as engaging beyond trad comic reading matter. It's great being able to hand stuff to people who don't read comics and not worry about them feeling 'alienated' straight away, as John says. Dante has been the only 2000ad story that my wife would read. None of the other stories appealed enough for her to invest any time in them. Good to see BCA embracing some diverse and well created titles. Oh and by 'legible' I meant something you might actually WANT to read as well as are ABLE to. Perhaps I should have said 'approachable'. Long live comics, anyway, anywhere !